The EH 101 has its genesis in an SKR (Sea King Replacement) study by the British MoD (Navy) in 1977. Westland responded with a proposal designated WG.34, but meanwhile the Italian navy had come up with a similar requirement, though one with the accent on shore basing rather than operations from warships. 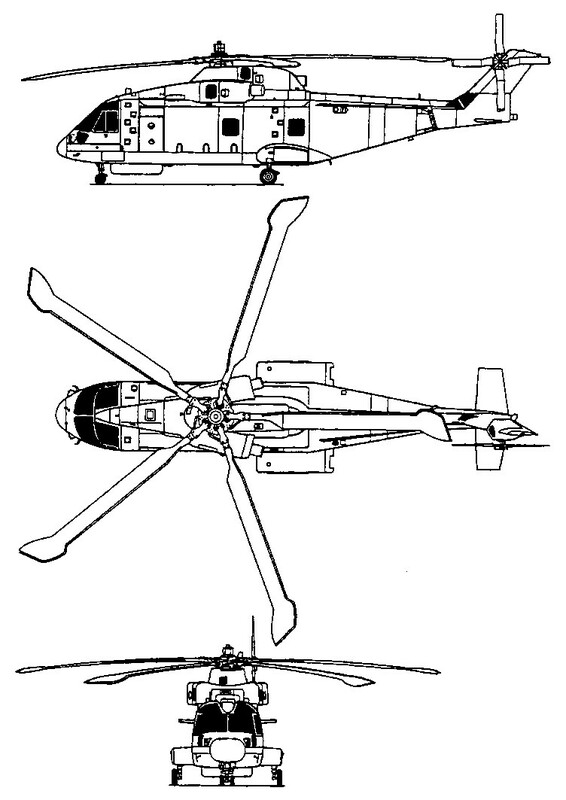 Westland and Agusta decided to collaborate, formed EHI (Elicotteri Helicopter Industries Ltd) in June 1980 and drew up the design for the EH 101 as the next generation helicopter for the British and Italian navies. The same basic machine is also being developed as a civil passenger and utility cargo transport whose engines, rotor systems, air-frame and main systems are common with those of the naval variant. The main cabin is 6.5 m (21 ft 4 in) long, 2.5 m (8 ft 2½ in) wide and, allowing for interior soundproofing, 1, 82 m (5 ft 11½ in) high, all dimensions exactly tailored to the missions, as are the folded dimensions for easy shipboard stowage. The maritime roles for which the EH 101 has been designed are ASW, anti-ship surveillance, anti-surface vessel strike, amphibious operations, SAR, AEW and vertrep (vertical replenishment). The main five-blade rotor has composite blades with extended-chord tips of the BERP type, while the tail carries a four-blade rotor and can be power-folded, like the main rotor blades, for reduced overall dimensions. The EH.101 prototype, with few of the features of the final aircraft, flew on 9 October 1987. There were nine EH-101 pre-production aircraft, starting with PP.1 which first flew on 9 October 1987 at Yeovil. The nine pre-production EH-101s are flying over 4000 hours of flight development and a 6000 hours maturity and reliability programme to ensure that EH-101 enters service as a fully proven helicopter. The first of nine pre-production prototypes made its first flight on 9 October 1987, followed by the second on 26 November. All nine EH 101s were flying by 1990. PP.3, the first civil variant, flew in September 1988 followed by PP.6, the Italian Navy variant in May 1989. PP.4, the basic naval development aircraft, first flew at Yeovil in June 1989 and was later fitted with Rolls-Royce RTM322 engines. PP.4 was destroyed in a crash on 7 April 1995 during high-altitude trials. PP.5, the Royal Navy Merlin variant first flew in October 1989 followed by PP.7, the rear ramp basic military utility variant, which flew in Italy in December 1989. PP.8, the pre-production Heliliner, first flew in April 1990, followed by the last pre-production aircraft PP.9, which first flew in December 1990. PP.9 is fitted with a rear ramp and has been engaged in a variety of flight development trials including undertaking the civil certification, along with PP.8 who will undertake an extensive maturity programme. The advanced five-bladed rotor system, and newly-designed rotor head, is built around a titanium hub surrounded by composites allowing multiple load paths for greater safety and damage tolerance. The helicopter has a full computerised fuel management system, triple hydraulic systems, two MIL-STD 1553B multi-plex databuses and includes a comprehensive Health and Usage Monitoring System (HUMS). EH-101 has an advanced ergonomically designed "glass cockpit" with six high definition, full colour displays making for reduced pilot workload and an all weather operational capability. The digital automatic flight control system (AFCS) incorporates dual, duplex architecture providing automatic stabilisation and autopilot facilities, allowing single pilot operations in both VFR and IFR conditions. In the civil version, avionics also include two air data computers, AHRS, VOR/ILS, Marker Beacon System, Weather Radar, RAD ALT, ADF, ATCST, DME, Standby Compass, Artificial Horizon, Flight Management System, Hyperbolic Navigation and a Global Positioning System (GPS). Early examples were to be powered by three General Electric CT7-2A turboshafts, although later production aircraft may have the Rolls-Royce/Turbomeca RTM.322. Three versions are currently planned: a naval EH.101 for land- or ship-based ASW/ASV operations, equipped with a 360 degree scan search radar (Ferranti Blue Kestrel for the Royal Navy) in a chin radome, dipping sonar and/or sonobuoys, Racal ESM, up to four homing torpedoes and anti-shipping missiles; a utility version to carry 28 troops or cargo; and a 30-seat commercial variant for civil use. The airframe is structurally similar for all versions, with a high degree of commonality, although the naval EH.101 features a folding tail section for shipboard stowage and the utility variant has a rear loading ramp. Westland rolled out the prototype triple-turbine EH.101 on April 7 1987, and the first flight was originally scheduled for late May. In September 1991, the Royal Navy ordered 44 maritime EH-101/Merlins. 42 being ordered by the Italian Navy. Canada has also selected the ASW variant by 1990. Other variants are a tactical transport and the civil Heliliner. Engines will be either three 2,100 shp (1 566 kW) R-R Turbomeca RTM 322 turboshafts (in the Merlin) or 1,682 shp (1 254 kW) GE T700-401As. First Civil variant went to the Tokyo Police in 1998. In the Utility/Support Helicopter role EH-101 can carry 30 combat troops, or lift internal freight weighing 4350kg or external loads up to 5000kg. The cabin can accommodate light vehicles, a light gun, crew and ammunition or 16 stretcher cases. On 9 March 1995 the UK Government confirmed an order for 22 EH-101 Support Helicopters/Utility variants for the Royal Air Force. The Merlin HC3 contract was awarded in June 1995 and entered service on 17 July 2001, a troop carrying variant. There are five main rotor blades, with advanced aerofoil section and BERP (British Experimental Rotor Programme) high speed tips. The tail rotor is slightly offset to port and has a four-bladed assembly. The Naval variant has a folding tail pylon and main rotor blades. The RAF utility variant has a folding rear ramp and has provision for pintle-mounted machine guns in the door or on the ramp, a chin turret for 12.7mm machine gun and stub wings for rocket pods. There is also provision for rapid installation of a FLIR turret which is carried beneath the nose, an in-flight refuelling (IFR) probe positioned beneath the nose offset to starboard, and for an SAR hoist on the starboard side. The utility Merlin is fully night vision goggles compatible and also carries infra-red countermeasures and radar warning receivers. The airframe is constructed largely from composite materials with parts of the structure being manufactured in Italy and the UK and with final assembly on the production line at Yeovil. The helo’s state-of-the-art “glass cockpit” looks exceptionally modern and is easily comprehensible for the two flight crew. A third crew member, the loadmaster, assists in look-ing after those in the cabin, or the on-board load, plus acts as a handy lookout during field landings or take-offs and during low-level flying. Designated CH-149 Cormorant with the Canadian military. Four EH.101 HEW (heliborne early warning) variant were to be delivered to the Italian Navy along with 16 other anti-submarine/amphibious variants. On December 18 2003, the US Department of Defense (DoD) issued a Request for Proposals to replace eleven VH-3D Sea King and eight VH-60N Whitehawk in the Marine One role. The US101 variant of the EH101 was selected on January 2005 and awarded a $1.7 billion contract. 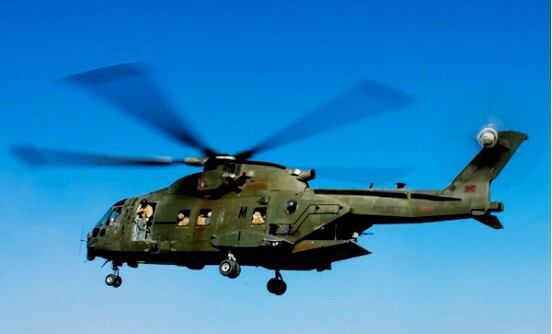 More than 200 suppliers in 41 states support Team US101, led by Lockheed Martin with team-mates Agusta Westland and Bell Helicopter Textron. Suppliers include some of America's leading aerospace companies, such as General Electric, ITT, Northrop Grumman, Kaman Aerospace and Palomar Products. 80 Percent of the US101 was to be made in the USA and the rest made in England and Italy. However, on June 2009, the US Navy formally terminated the VH-71A Kestrel contract. The first VH-71 made its initial flight on for delivery to NAS Patuxent River, Maryland. Engine: 2 x GE CT7-6 or R-RTM RTM322. Instant pwr: 1500 or 1565 kW. Engine: 3 x GE T700-T6A. Engine: 3 x GE CT7-6. Max range (aux fuel): 2093 km. Engine: 3 x R-RTM RTM322. Engines: 3 x Rolls-Royce Turbomeca RTM 322-02/8, 2,240 shp each. Average cruise: 150 kts (173 mph). Range: 700 miles (1,129 km). Max internal load; 24 combat equipped troops / 4,535 kg (10,000 lbs) max underslung load.